AMD Athlon 64 X2 4800+ 2 2400 MHz 1 GB Dual DDR-400 VIA K8T880 Pro Windows XP Pro SP2 0:03:54 110.3 Pascal J.
Intel Core 2 Duo T7200 (Merom) 2 2000 MHz 2 GB DDR2-533 Intel 945PM Windows XP Home SP2 0:04:12 102.4 Marcel P.
AMD Athlon 64 3200+ 1 2020 MHz 1 GB Nvidia nForce4 Ultra Windows XP Pro SP2 0:04:43 91.2 Marcel P.
Download the tg2bench.zip test file and follow the instructions. Please send your results to terragen@kk3d.de. 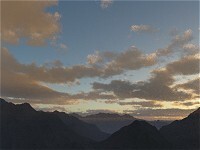 Download Terragen™ 2 Technology Preview from Planetside Software.